Grey is a color that pairs nicely with almost any color shade. It also looks great as a formal color worn for a wedding event; or a casual color worn for a night out in the town. However, when it comes to choosing the correct pair of grey pants; finding what to wear with grey pants can be a little bit challenging for most. Grey pants can look stylish when paired with a dress shirt or casual button-up; and can be worn from the office to cocktail hour. You can clearly see that grey is a color that is here to stay. 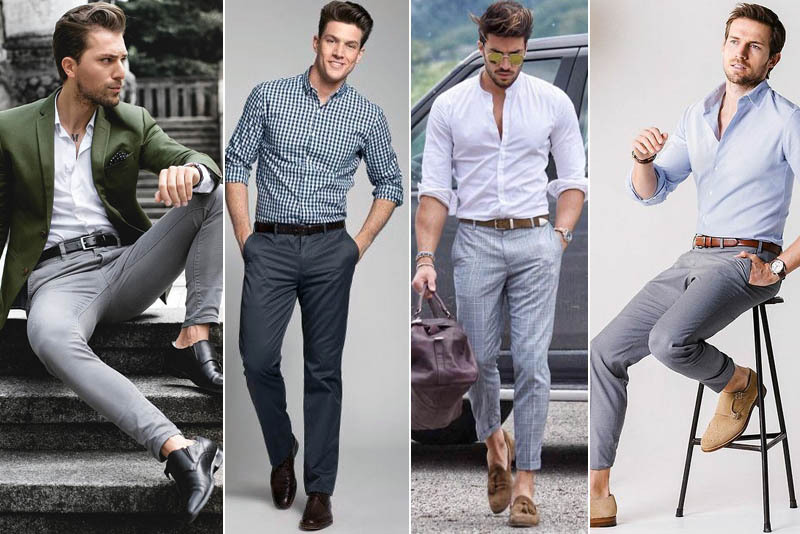 If you’re interested in learning what to wear with grey pants; and how to pair the right shirt and accessories with your grey pants; then keep on reading. There are dark and light shades of grey. As a result, there are certain undertones like blue or green that can be seen in the grey color depending on how the light shines on the fabric. Different grey pants will go with certain colors, such a brown, burnt orange, or yellow shirt pair well with warm grey pants. And, if you have a deep purple, blue, or green color shirt or blazer then you may want to consider wearing a pair of cool grey pants. When it comes to patterns or prints, try to find the major color and use that to select the shade of grey you will wear. For example, if you have a purple shirt that is thinly striped with yellow, you can still get away with wearing cool grey pants because purple is dominant. Although these are the general guidelines, don’t be afraid to step out of your comfort zone and wear a pair of cool grey paints with a warm color shirt. Grey pants look stylish when paired with a business blazer or a simple V-neck shirt. Depending on the occasion you are dressing for, grey dress pants or chinos may be more fitting. Always consider the event you are going to before selecting a pair of pants. Casual occasions do not have to mean wearing jeans, jean shorts, or linen type pants. In fact, grey pants make a great casual pant to wear on a variety of occasions. For an informal look, try a pair of light or dark grey pants with a neutral colored t-shirt or button up. Light grey pants appear to be slightly more casual and if you find a distressed pair then even better. You’ll stand out uniquely amongst the crowd in your grey pants while everyone walks around in jeans or linen shorts. The next time you have an event that is business casual, instead of reaching for the jeans or black dress pants, put on a pair of grey pants. You can pair grey pants with a white V-neck t-shirt, black or denim blue blazer, and a pair of dress shoes. Again, the darker the pants, the warmer the accessories you should pair with it and vice versa. Attending a wedding or graduation ceremony means that the overall outfit must be dressier than casual wear. Pairing a blazer, dress jacket, or button-up shirt with a pair of grey pants can create a sleek, stylish outfit that will have all eyes on you. Frequently, black dress clothes are seen at weddings or graduation ceremonies, but considering these occasions frequently take place in hot summer months, grey pants can be more breathable than black clothes. Due to the simplistic but stylish nature of grey shades, pairing them with other shades is an easy task. That being said, certain grey shades pair better with certain colors, such as white with dark grey or dark blue with light grey. A classic, bright white shirt pairs nicely with a pair of dark grey pants. While white can also look great with light grey pants; the contrast of a crisp white shirt with a dark grey pant will have you looking classy and sophisticated no matter where you are off to. A royal blue or denim blue shirt paired with a warm grey pant creates a sleek and business-like look. If you want to go for a more casual look; try pairing the royal or denim blue shirt with a cool grey pant and a pair of sneakers. Additionally, a tie can be worn with either of these two outfits and will leave you feeling casual but trendy. Certain colors of grey have a green undertone; therefore, it is quite easy to pair any shade of green with grey pants. Try wearing a light green polo shirt or dress shirt with a light grey pant and tie for the perfect summer outfit. White shoes are normally avoided for the very fact that they get dirty easily! That being said, white shoes are stylish and trendy when worn with grey pants. White shoes can be paired with dark or light grey pants; and best suit either a white, black, or neutral colored shirt or jacket. Brown shoes can make any look appear sophisticated and professional. Although some may consider brown and grey as not a good match because of their difference in shade; they actually can be paired together quite well. Again, be daring and go for a color match that most would not. Chocolate brown shoes pair nicely with light grey pants; and either a light brown, white, or light grey shirt (yes, a light grey top and dark grey pant can look amazing). You can achieve the same great look with either dark purple or burgundy shoes, as well. When it comes to finding the perfect tie, you have to consider the color of shirt you are wearing. 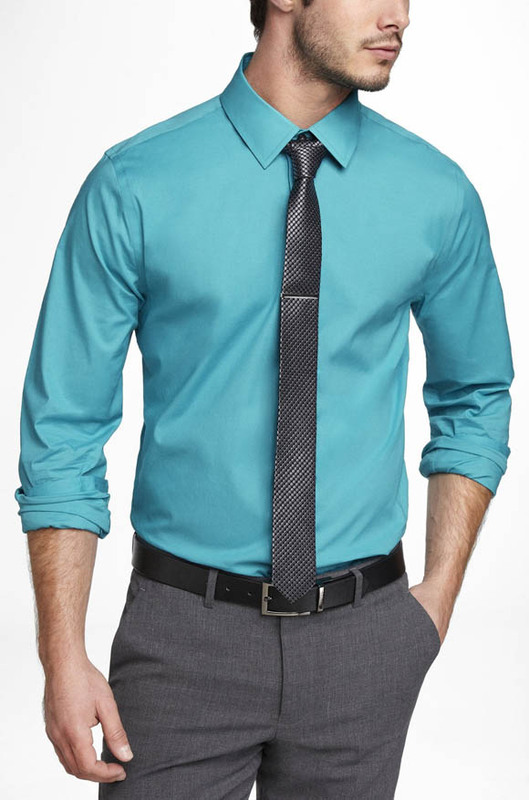 Dark color shirts with grey pants can look great with light colored ties and vice versa. Ties can even be great statement pieces so you can be bold with your color or pattern choice. Finding the right accessories for an outfit can be challenging; no matter the colors you are trying to pair with it. 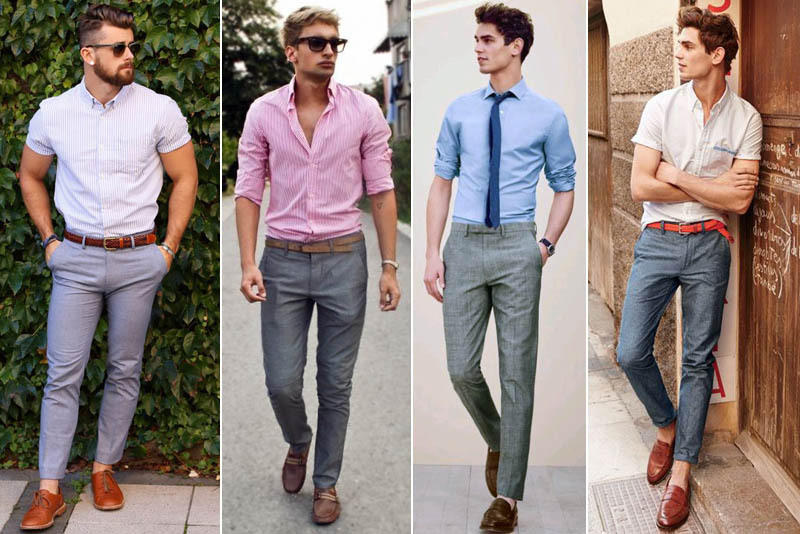 For a grey pant outfit, it is a fairly simple task depending on the shirt you are wearing. Accessories do not always have to perfectly match; a bold accessory makes a confident statement. Grey pants are extremely versatile. This means you can wear them to the office, the bar, a wedding, a birthday party, or even to the mall for a shopping trip. They offer a style of sophistication that black or white pants aren’t able to, and can be paired with almost any color top. The next time you are debating on whether or not to purchase that pair of grey pants, go for it and see how your wardrobe and confidence changes for the better.